The miscelaneous page for Wormy or Dave Trampier related stuff. Here I am going to post miscellaneous stuff that I have collected that has something to do with Wormy or Dave Trampier. I have acquried some Wormy stuff along the way. 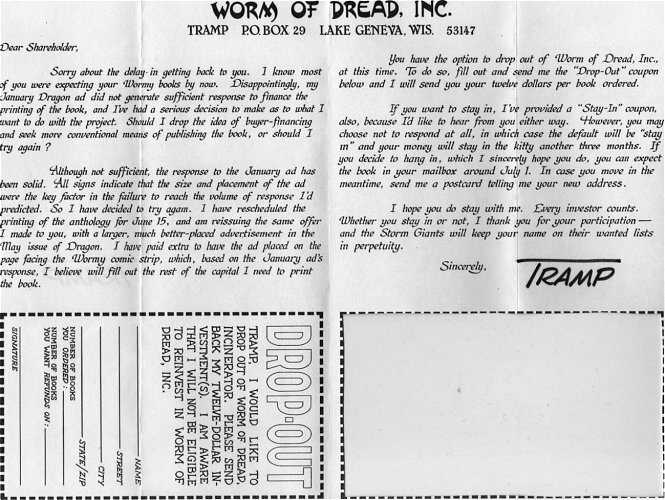 The button on the main page was for investing in the Wormy anthology, the certificate below was also issued for being an investor in the "Worm of Dread." Here is the share in the Worm of Dread that I got for investing in the Wormy Anthology. I am still an investor, because when Dave scrapped the idea of the book and sent everyone their money back, I told him to hang onto mine just in case the book ever got off the ground. So, Dave if you see this, you owe me ten bucks (but I would rather have the book). Here are some Wormy sketches that I drew probably in 1985. Here is another pretty in depth letter from Tramp. A share holder letter, where Dave realizes getting the book done is taking more than he thought. There were a Stay in and a Drop out coupon.